The Naughty Step is a discipline technique, in which parents require children who are behaving inappropriately to sit on a certain step for a designated period of time. 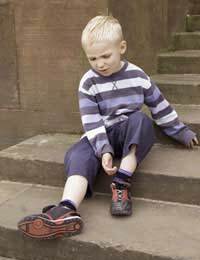 Many parents favour the Naughty Step, as it is an easy and effective way to teach children that they have been behaving inappropriately. It also helps children to calm down and decide for themselves how to rectify their behaviour. In theory, the Naughty Step is a simple device – a designated step on which children are placed when they are misbehaving. In reality the Naughty Step can be the sight of multiple battles of will. Some children love to manipulate the technique and try to outfox their parents by keeping only one foot or one finger on the step, and others are amenable to remaining on the step however they prefer to cry, kick or scream the entire time. Still, other children will realise that they are not physically bound to the step, and will take to vanishing for small periods when they should be sitting as instructed. To counteract these trials, parents should either make sure that the step is in their line of vision or routinely check on the child while (s)he is seated on the step. The Naughty Step is an effective discipline technique for many reasons. To begin with, it immediately removes a child from the activity or situation which provoked inappropriate behaviour thus, (hopefully) neutralising the behaviour itself. It is also immediate so there is no confusion about why the child is being removed, or which behaviours were inappropriate. Finally, it allows the child the time and space required to calm down and think through their actions. When children are placed on the Naughty Step they should be directed that they can leave when they are ready to discuss the situation. This directs the child’s thoughts towards a resolution of the conflict, and which behaviours would be more appropriate in similar situations in the future. The Naughty Step is not a technique exclusive to families in large houses, and in fact it can be adapted to almost any living space. For example, a Naughty Rug, Naughty Corner or Naughty Stool works just as well. Almost anything can be used in the place of an actual step, though comfortable chairs and beds should be avoided. The Naughty Step can also be adapted to larger areas as the child grows, so that by the time the child reaches 8 or 9 years of age, there is a designated “calming room” or area where they can be sent as needed. Finally, the Naughty Step can also be used in public – even if it means directing your child to sit quietly on a napkin! Often parents are wary of disciplining children in public, but the Naughty Step is so commonplace these days that other parents are likely to applaud its use whenever and wherever misbehaviour occurs. Not every parent uses the Naughty Step, but it is a successful discipline technique for many. The Naughty Step removes a child from the source of trouble, it allows the child the time and space to calm down, and it effectively communicates to the child that their behaviour was inappropriate. The Naughty Step can even be adapted to suit any child or location, making it perfectly portable and effective. "The naughty step" is no different from using techniques like the "Naughty chair" and "Time-out".These are still forms of punishment.The word, "Naughty" already has a negative connotation and when we send a child to the "naughty" space, we are telling the child that he is naughty.In addition, we are alienating the child from others, from a loved one, at a time where he or she needs emotional assistance or affirmation. How would a young child decide for himself when would be a good time for him to calm down when he is feeling rejected by a parent, a caregiver, or a significant other? Young children display undesired behaviour for a number of reasons. They are young and their brain is not developed sufficiently to remember all the rules of social engagement. They are tired. They are overwhelmed. These are just 3 reasons and there are plenty more. How is putting a child on a "naughty step" because of any of the above reasons going to help the child learn desired behaviour? You got the effects of punishment on children right but you got this part so very wrong.